View Poll Results: Have you seen Altitude play live? I blame ppcock. :p He got me interested and I've been hooked ever since. I don't really have anything that was obscenely expensive. Original pressing of David Bowie's Space Oddity. I got my hands on it from my Friend's Father who was clearing out his old vinyl collection. I love a lot of the tunes on that plate. Played in a really sketchy part of Toronto... little G-U-not thugs asking if I have any 50Cent and what not. I made an effort to look as I think he was armed. 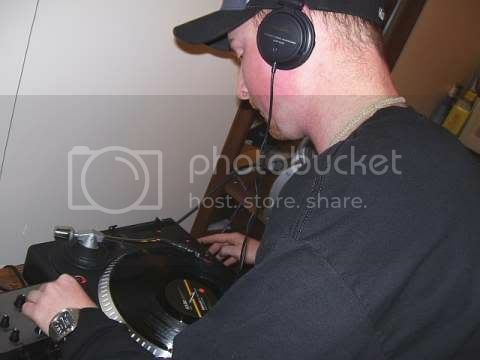 One Guy at said House Party came up to the Decks and was all hyped... "DUDE! YOU MIX JUST LIKE MY FAVORITE DJ... KENNY KEN!" I didn't really know how to take that one. I love the fact that when I'm spinning, I'm not thinking about anything but the Music. It's a retreat for me even though I'm only in my Living Room. - extent or distance upward; height. - Usually, altitudes. a high place or region: mountain altitudes. CSquared, ppcock, DJ Pegasus, decypher, Robb Peppertree, Yoshimojo and especially lbb are the People I credit with keeping me at it and helping me develop my skills. Not a lot I can really say here as I really am horrible at tooting my own Horn. I'm looking forward to coming back to Vancouver and playing out sometime. Last edited by mapleleaf4ever; Jul 14, 08 at 01:35 AM. Alrighty... So here goes... I've been learning for a long time and never actually recorded a decent length Set myself for any People to download so I gave my best shot today. Last edited by mapleleaf4ever; Apr 17, 07 at 02:51 AM. Oh, bored made another one. A little more aggressive than the last. Send big files the easy way with sendspace. Files too large for email attachments? No problem! Big ups to the Sweet Sensi Crew for this opportunity. his month on Wednesday May 8 (that's tonight Folks!) Sweet Sensi Crew brings you Mr. Brown who is going to Swerve it Out at the Blue Moon. Stop by while the weather is so kickass. Last edited by mapleleaf4ever; May 09, 07 at 08:31 AM. So I got bored and made another Saturday Night Liquid Mix... got some new tunes so why not? Some spare time and effort lead me to crank out a nice chill Mix for your Sunday evening. 11. Logistics - Together V.I.P. 18. Total Science - Bang Out V.I.P. Oh and on June 20th, 2007 tune into Drum and Bass, Drum and Bass information, audio, news, reviews and interviews where I'll be on as a Guest with DJ Carnage. Playing tonight on dnb.techno.fm with DJ Kensai. Also watch out for me on www.bassjunkees.com on June 20th where I'll be b2b with DJ Carnage. Tune in on the 20th! DOO EEEEET! Check out www.bassjunkees.com tomorrow night we're on from 4pm Pacific Time. Last edited by mapleleaf4ever; Jun 21, 07 at 03:51 PM. ^ Look for more fresh liquid funk vibes coming from me soon! Touching down at the Blue Moon at Queen and Broadview on November 14th! The Sweet Sensi Crew doing things proper once again. back in van, when are you coming to visit? This month we bring you a birthday celebration of magnificent proportions!!! Altitude, Jocelyn D, and DJ Clear are all Scorpios and they will be celebrating in true Sweet Sensi Crew Fashion!!! If you are a Scorpio come out and get down!!! 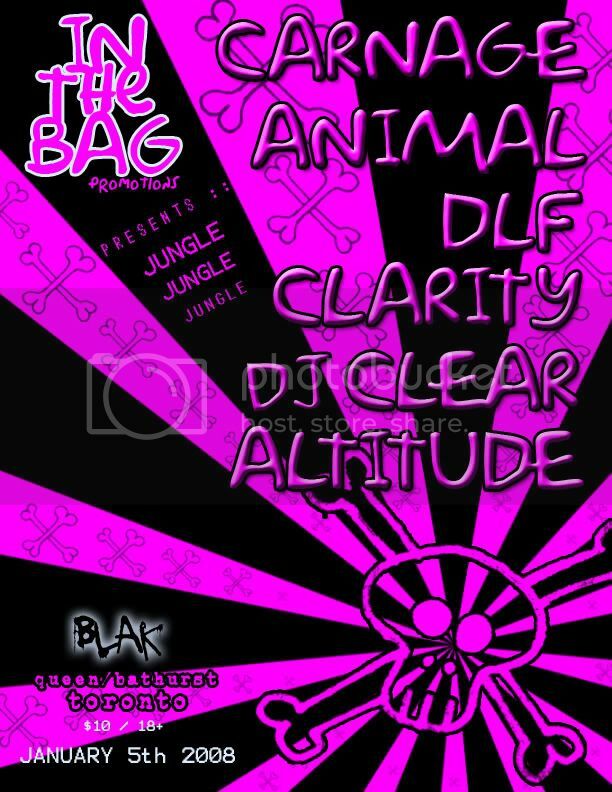 I'm rinsing out in the 2nd Room alongside: DJ Clarity, DJ Clear, DLF, Carnage and Animal. Last edited by mapleleaf4ever; Dec 11, 07 at 01:56 PM. And coming up on Dec.21 playing out at the Blue Moon for a Toronto Food Bank Fundraiser/Food Drive. Last Year Sweet Sensi Crew & Mad Monkey Productions brought you Spread A Little Love. The Proceeds went to the Daily Bread Foodbank. Together, we raised over $300 and donated a few boxes of food as well.Well this year is no different. While many of us are well taken care of, others are not so fortunate. Thus we at Sweet Sensi feel the need to Spread a Little Move Love.Join us for a night of jungle beats and good times for a good cause. Chalking another one into my calendar. Myself and DJ Kensai of In Da Jungle Recordings will be rocking out with some main-room Liquid Bizness. Standing by for a Flyer which i'll post as soon as it arrives.